Canon Pixma MG2550 inkjet is a printer which uncovers the full PIXMA experience, with solutions for organising and printing your photos, scanning and accessing online services. The printer is designed with a stylish white finish and aimed for home users. It takes up less space and ensures effortless paper loading and ink replacement. The printer's Canon Pixma MG2550 ink cartridges are also cost-effective and offer large print volume. Canon Pixma MG2550, is a device with time and energy-saving features. It has a minimal control panel on left, with just operational buttons and does not have a display screen. This printer weighs 3.5Kg so easy to carry and set-up, measures 426mm wide, 145mm tall, and 306mm long. It has high-speed USB port B for direct PC connectivity. There is a CIS flatbed photo scanner with a resolution of 600x1200dpi. The rear tray with a maximum paper input capacity of 60 sheets. The Canon Pixma MG2550 ink cartridges are two mounted cartridges, one black and one tri-colors. With A4 ISO ESAT speeds of 8.0ipm for mono and 4.0ipm for colour printing. This model provides the possibility to use the new format XXL cartridge, which guarantees a higher yield (up to 400 pages in black and white and 300 colour pages). Delivers a very low cost-per-print. Canon Pixma MG2550 is an affordable device for home users. It's XL Canon MG2550 ink cartridges deliver significantly more pages and can offer up to 30% of savings per page compared to their standard equivalents. Auto Clip function of the Easy-WebPrint EX plug-in for Internet Explorer makes it simple to print and thus easy to use. The printed text is broken and misaligned, how to correct it? 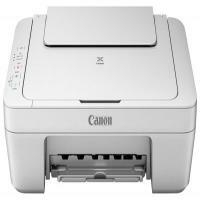 The Canon Pixma MG2550 is a multifunctional printer that is apt for use at home and small offices. It is shipped along with Canon Pixma MG2550 ink cartridges. The printer offers great print quality in an affordable price. Over time you start experiencing printing problems like broken prints or misaligned prints. The main cause of this misalignment of prints is the misalignment of the print head. So no matter how good the print quality is using Canon Pixma MG2550 ink cartridges, the prints will be broken and misaligned until you align the print head. Now load an A4 or letter sized paper in the paper tray. You should load the paper in the rear tray. Pull the paper output tray out and the extension as well to catch the printer paper. Now press and hold the Stop button till the point when the Alarm lamp flashes and orange light four times. Immediate release the button at this point. The print head alignment sheet will get printed at this point. At this step, you need to be sure that the ink levels in the Canon Pixma MG2550 ink cartridges of your printer are not low. If the levels are low, the print head alignment sheet will not get printer correctly. Before you print the sheet, you will have to replace the ink cartridges. When the print head alignment sheet has been printed, make sure you let it rest in the paper output tray. Do not touch it immediately after the print. This sheet needs to be scanned therefore it should remain clear of any stains or wrinkles. If the sheet has not been printed properly then press the Stop button and repeat the process from step 1. Once you have the sheet, place it in the scanner from the bottom right corner which has an arrow mark on it. Close the scanner cover and press the Color or the Black button. The print heads will be aligned. Q. I’m thinking to buy Canon Pixma MG2550 printer for my home purpose. Can you tell me about some additional features this printer has? A. Canon Pixma MG2550 printer comes up with a solution of organising and printing photos, scanning and accessing online services. The printer is designed in such a way that it acquires less space and ensures effortless paper loading and ink replacement options. Also, these printers are cost-effective in nature and offer large print volume with auto power on/off facility. Q. Is it possible to get higher yield of prints using this printer? A. Yes, definitely. In this printer, we can use new format XXL cartridge, which guarantees higher yield, ie 400 pages in black and white & 300 colour pages. Q. While buying original Canon Pixma MG2550 ink cartridges, each time the printer ink replacement, costs me much. Please suggest me some low-cost ink cartridge that provides good quality prints. A. We would recommend you to buy compatible Canon Pixma MG2550 ink cartridges for your printer. The main difference between compatible and the original ones is the difference in cost. The compatible ink cartridges will save up to 50% of your money, as compared to the original ones. Also, they produce impressive results as the original ones. These compatible ink cartridges are available at Printerinkcartridges.ie and comes with 100% satisfaction guarantee. We offer both coloured as well as black coloured ink cartridges. Both single pack and multiple pack ink cartridge are available here. Q. Can I use Canon Pixma MG2550 ink cartridges with other printers also? A. Yes, you are free to use these ink cartridges with Canon Pixma iP2840, Canon Pixma MG2450, Canon Pixma MG2455, Canon Pixma MG2550, Canon Pixma MG2950, Canon Pixma MX495, Canon Pixma MG3050, Canon Pixma MG2550S, Canon Pixma MG3051, Canon Pixma MG3053, Canon Pixma iP2850, Canon Pixma MG2555S and other printer models. Q. How can I identify with which operating system is my Canon product compatible? A. To check whether your product is compatible or not with a specific operating system, please click on the driver's tab. You will then either be presented with the compatible driver to download or a message explaining the compatibility status of your product. Q. Where can I find the serial number for my Canon Pixma printer? A. The location of the serial number may vary between different Canon products. The serial number for your PIXMA printer will be the combination of letters and numbers. It consists of 9 characters out of which 4 letters are followed by 5 numbers for e.g. XXXX00000. The serial number will be printed on a sticker and can be found either on the back or inside of your machine. Q. The Back of the Paper Is Smudged. What could be the reason? A. If the paper smudges, confirm the paper and print quality settings for your printer. You can also refer to user manual if, you find that the print results are not satisfactory. Sometimes ink leakage issues from the Canon Pixma MG2550 ink cartridges could also result in smudging. Perform the bottom plate cleaning from the inside of the machine to avoid such results. Q. What to do when ink is not ejected correctly from the printer? Q. I am looking for a stylish printer for home use. Will the Canon Pixma MG2550 Printer solve my purpose? A. The Canon Pixma MG2550 inkjet printer would be the perfect choice for home use as it has the option of scanning and accessing online services. The printer occupies less space, has a stylish white exterior and it has an effortless paper loading. The ink replacement is also quite easy and cost effective. It is not very complicated to use and weighs only 3.5 kg which makes it easy to carry or install at home. Q. Can I get coloured printouts with the Canon Pixma MG2550 Printer? A. The inkjet printer has two mounted cartridges, one for black printing and the other for coloured printing. One can easily print coloured printouts with the Canon MG2550 printer. The print also support XXL version of its cartridges which ensures a higher yield of printing i.e. 400 pages in black and white and 300 pages in colour. Q. What are the disadvantages of this printer which I should know before purchasing? A. The printer is not suitable for intensive printing done in offices and also does not have a duplex printing support. The printing speed is comparatively slower and the print quality is somewhat low. Q. Is the printer shipped with cartridges or do I need to purchase it separately? A. The printer is shipped along with the Canon Pixma MG2550 ink cartridges. Q. What kind of print quality can I expect from the Canon Pixma MG2550 ink cartridges? A. The ink of the Canon Pixma MG2550 ink cartridges is of high quality and one will get high quality print. Q. Can I install both black coloured cartridges in cartridge slots instead of one black and one tri-colour in the Canon Pixma MG2550 printer? A. The printer is designed in a way that all the cartridges have to be placed in their correct slots else the printer will not be able to read the chips properly and stop working. Q. Do I need to service the printer from time to time? A. A time to time cleaning of the printhead can ensure a smooth and hassle free printing. Also make sure to refill or change your Canon Pixma MG2550 ink cartridges if the printing quality has lightened and the printer pops up the message of running low on ink. Q. Can the printer fax? A. Unfortunately, the printer does not have fax facility. Q. Will the Canon Pixma MG2550 ink cartridges last for a couple of months? A. The cartridges have superior quality ink which does not dry up easily and also lasts for quite long. This prevents one from changing the cartridges constantly. However, the ink capacities of the cartridges differ. Where the black ink cartridge has the ink volume of 17 ml, the other tri-colour cartridges has the an ink volume of 16.5 ml. Q. Are there any ways with which one can avoid the Canon Pixma MG2550 cartridges from drying up quickly? A. If you do not use the cartridges for long, they will dry up and this would happen with any kind of cartridge. One should at least take a print out every month to ensure the printer ink does not dry up and this also ensures the smooth running of the printer. Q. Is it advisable to buy the Compatible Canon Pixma MG2550 ink cartridges in a large quantity and store them without the risk of them drying up? A. If you require heavy printing jobs in your office or home, then buying in a large quantity would be economical for you. It would be easier on your pocket and you would always have stock of cartridges ready. The compatible Canon Pixma MG2550 ink cartridges offered by the PrinterInkCartridges.ie will last up to 6 months before they start drying out. These cartridges come with a replacement guarantee in case they are found faulty or dried up. Buying the multipack will not only cut down on your printing budget but will always make sure you have a stock of the best quality. It is better to keep them sealed and only opening the seal on installation to prevent drying.